Note XP users: many of the recent updates are for newer operating systems. We advise not to update if you have XP. Choose SAVE. When the update finishes downloading, make sure you do not have your copy of Model Builder open. Then, double click the downloaded file to start the installation. Install to the same folder that your Model Builder is located in. 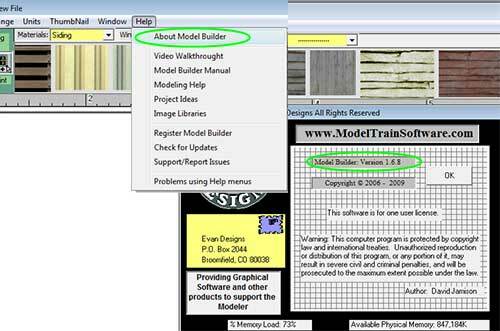 Verify your Model Builder updated by again checking "Help" >"About Model Builder"
Added support for .dxf and .wmf import with more programs. Visual interface for selecting brick designer patterns and styles. Added support for A3 and custom paper sizes. Program setting changes now saves correctly with Win7 OS. Improved duplicate handling on imported images with Win7. Added support for file sharing. .gif embed and repaired the stretch of imported .gif so you can now share your Model Builder files that contain imported images in .gif format with others. users file share website today! Improvement to menu items based on user feedback, we have made menus more intuitive. 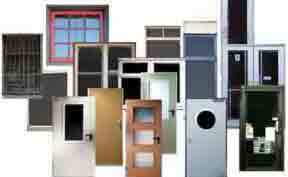 Sample buildings now available, pre-made and ready to open from the opening screen. Print these new buildings as-is or modify to your tastes. Now you can double-click any saved file to open it into the Model Builder design screen, ready to modify. Set up your preferences for each time Model Builder opens. Set paper size to USA letter or European A4. Set the location your files save to. Set the location you like to import art from by clicking the "Modify" button. Set this all up in the new area found under "File" > "Program Settings"
Reduced the memory requirements for many operations. Screen draws and Paint operations are now faster and smoother than earlier versions. Improvements to the Brick and Siding Editors. Improvements to Building Plan manipulation. Perform all operations in any Zoom Level. Now you can work in 50% screen zoom to see more of your project at once and reduce memory requirements for faster operations. Templates for Roof lines and glue tabs. This update will automatically overwrite previous versions, saved files will not be lost. As always, we recommend that you view the new copies of the manual and the project idea book. 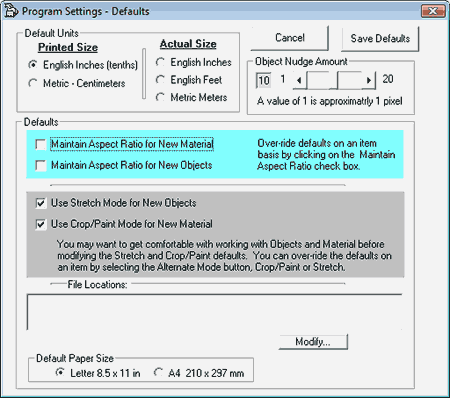 The manuals are located in the "Help" drop down menu inside Model Builder.